Here is a bunch of images from our current work on new trees - we are trying to have more variety in types of vegetation that you can meet along the road in different parts of the map. You will most likely never see the new trees at this density though, this was an experiment that looked great and felt great on a high-end 3D graphics card, but we are reminded again and again that we should strive to support reasonably well even quite old graphics cards. So we have to make a lot of compromises between how things could look and how they end up looking because of performance considerations. wow nice very great work keep up!!! BEST WORK AND SIMULATOR EVER!!!! Super! Release date and Romania on the map, please? Yes! Great job! Fog looks awesome! hope this game support ATI gpu. I really hope that waht you guys wrote in the news become thruth because I don't have a much powerful graphic card and to have fluid experience with GTS I had to put vegetation details on low! My bad feeling with too much higher request for play ETS2 it's raising every time I see those beutifuls screenshots and the awesome videos of this marveolus game...I'm really worried about that and waiting like no other time before a demo for calming (or maybe agree) my fears about that...at this time I can only cross my fingers! By the way, keep the good work scs!!! but GTS at 1440x900 don't run on all high details...to have a fluid framerate I had to put antialiasing at 8x, low details on vegetaion and reflections but I can conserve high details on textures that it's so important for me! FOOOOOG, RAIIIIIIIIIIN AND PROLLY WORKING GPS!!!!!!!!! WHAT ELSE CAN SOME1 DREAM????????????? Watercolour-effect at the top of Picture 9. Very good indeed, the graph of the game is awesome, and big changes I noticed was this dense fog, mirrors have greater angle of view inside the cabin, the entire interior was remodeled, compared to previous editions, the loads are more realistic, , the GPS showed you a while ago. But good job for the whole team, this is a great achievement of the company. SUPPORT FOR ATI GRAPHICS CARDS PLZ SCS. We would like to hear about the new game. Great news again SCS, the interior view just killed me.. fog and the GPS just finished what the interior view begin :X .. splendid work as aways, Keep up ! Hope to see news about the new game soon tough. Oh and .. consider the low graphic cards, but don't forget the high ones too, I got one Nvidia GT 430 and I'm dying to play ETS2 on alien graphics ! Nvidia GT 430 is decidedly a LOW END card. Don't be confused by the fact that it's 4xx series chip - in each generation, the spectrum from low end to high end differs wildly in performance, and GT 430 is definitely just an entry-level performer in its generation. What about Intel HD Graphics 3000 ? Can I run the game on high details or medium at least ? @anonymous over there: I don't think so...never with low details you can play with an integreted grapich card!!! You have a notebook right? Yep, I own a notebook. I played FIFA 12 at medium-high details and it runs smooth and it never lags. 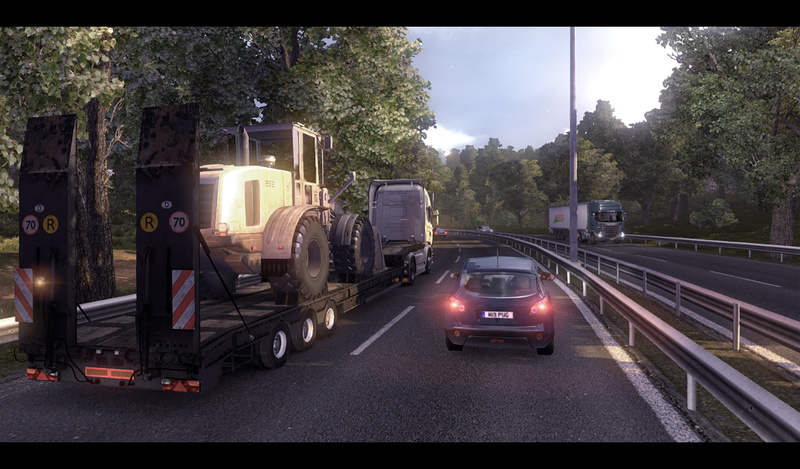 I'm sure that I'm gonna be able to play ETS 2 at medium-high details too. I played GTS maxed out, I get 50-55 fps on GT440. Positively splendid looking, SCS! Would of course be nice to have the option to bump up the density of trees for those with a more powerful machine, but yes, the more that can actually run the game without lag the better. What about the gps showed how long it was until they were at their destination with the Average Speed ​​now had? here as those wheels Iveco Stralis make them the same for sale. Very please so will look real. If it is possible to do it would be truly great. but why the fog lamp on the bumper is not working ? Wow very good work. Go on SCS. I am really impressed. It seems like we waited for somethin extremely Great. Thanks SCS for keeping us informed. ...I hope that will be able to come to the wall on picture 4/10. i HOPE YOU'LL MAKE THE DENSITY OF AUTOGEN SCALABLE SO THAT WE WHO HAVE INVESTED IN A $4000 COMPUTER CAN GET OUR KICKS! LOOKS STUNNING! Ohh man,that interior is just amazing! Trees are perfect; I agree with anonymous above, scalable auto-gen of vegetation/trees density is great idea. I, on the opposite side, have not so good computer and there is probably slight chance to buy better this year. So maybe I would be happy to set density very low and others, who have hi-end machines, could enjoy full environment. Wonderful! 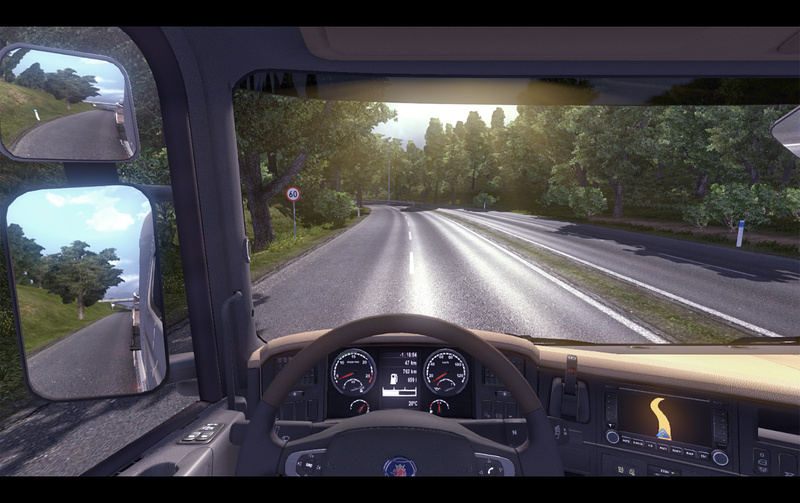 I thought about it yesterday, playing German Truck Simulator. I had an idea to send You a message about it... but it seems like you read my thoughts... Fog and lighting are also good. Just make snow textures on very deep bump map .. change physics to make slippery roads and invisible snow reactions on suspension, but snow will be just textures, and wheels leave traces.. you can see that on some games... sry for eng. No need for 2 meters of snow on the road,they can put a falling snowflakes(like rain) and white snow textures of ground,road,trees,maybe a little slower vehicle performance...eg.When the snow starts falling that all normal textures automatic changes in winter,snowy textures and we wait until they load,or that they change/load while we sleep...that not interferes us while driving. Držim Vám palce, ať se vám daří. Why in last two messages with screenshot only Scania? It ETS2 or ScaniaTS2? Whether it is a lot of attention for Scania? Those screens are just fabulous! The nature is so beautiful and it feels so real :) Once again you did an awesome job, keep spoiling us with such nice screens! And the fog effect is so cool! Finally the driving is more challenging! Now we have this thickness of fog, I assume we can also use fog-lights right?! Thanks SCS, keep spoiling us please, it makes the waiting slightly more bearable! Scs? pre purchase this game? Can Nvidia GT440 maxed out without lag? 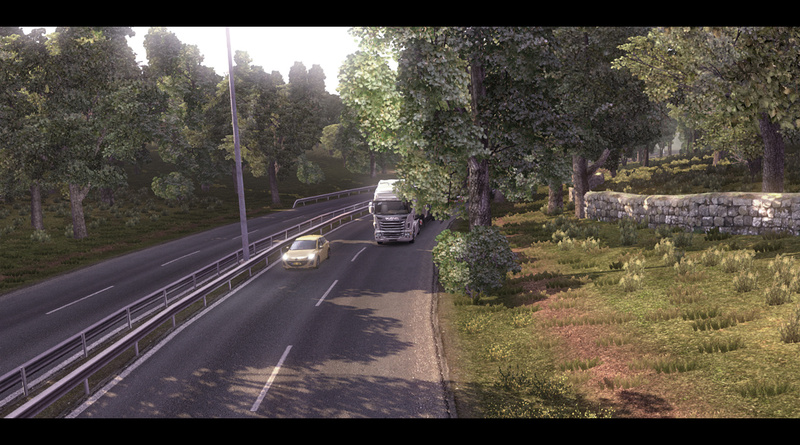 Wow those are some really nice trees SCS! I would recommend having an option for trees, but that may be too difficult to do, but do it if you can. The scenery is fantastic, your game is going to sell very well! Keep the good work up, and don't worry about not posting as often, if you're too busy then postpone it. Make head movements for better feeling !!! Please just implement a vegetation density option so that it is possible to max it out or drop it so that there are very few trees on the roads and so on. So if I use to own a decent graphic card, I can enjoy it's possibilitys. I'm sure this option is not hard to implement (hold in mind, that you want this game to be the platform for the futher devolopment of the game itself). You guys are amazing. Am soo lucking forward to getting my hands on the game. Damn fine images can't wait till release date. I personally wish you would leave this level of tree density available in the retail product as it looks so good. Please consider having this available for High End configurations at the very least. SCS ..u are doing a very very nice job...pics are damn realistic...First one is epic..ahh I wonder what video card are u using? ?...since u said its a high end one..
when will be demo of ets2?? Please SCS, add this as an option in the Options menu. It's a too good feature to not be included in the final game. Please. Totally agree with you, it would be a shame to not have this in the game. It should be an option or free download able content for people who want this. Dear SCS, please post current system requirements to let people know what they exactly need to play. And make some snow like in 18 WoS Across America, please... And dont forget about Baltic States. Can't you guys just make like a huge slide bar. I know, SCS you are trying to appeal to a wider amount of people, even those with low end computers, but please don't go too low. I would love to play this game at incredible graphics on my Geforce GTX 560 Ti and i5 processor. The tree density and fog is really, really wonderful.. Very nice indeed. I really like the idea of internal GPS on the dashboard. You can rest assure that I'm buying this game. Great job SCS. Keep it up! I don't think that there'll be several maps with different vegetation density, because the map looks completely man made. Still I am hoping for some snow in the Alps and later map add-ons for other mountainous parts of Europe like the Pyrenees. You might consider a poll on this blog to find out on what kind of computer the average joe is playing your games on. I guess it'll be biased towards high end machines, for the simple fact that people like to brag, but it might be better than nothing. Stunningly beautiful images. Can't wait till release. can i support it on high settings like gts? Same problem with GTS even if I had a better configuration than yours...please scs, optimize the game a little bit better than GTS so maybe it is a little bit light to run in every machine!!! I have Ati HD4850 512MB and GTS has good fps on max settings .. and hey, don't matter on graphic card MEMORY!!! but on graphic chip (256Mb is also powerful then 2GB same GPU) you cant know in specification how powerful is graphic card. Make the graphics so they auto detect the power of your computer. So then players with high end cards can have the best detail and the other players who insist on playing on old out dated computers can have low end graphics. JUST DONT GO TOO LOW ON GRAPHICS. WE WHO ARE A REAL PC ENTHUSIAST, WHO HAD THE PC's woth about 4000$+ WANT TO ENJOY THE GRAPHICS. Option for extreme graphics will be really nice. How can I tell if my video card is a high-end video card? Most demo's get released a few days after or at the publish of the game, I think you're talking about an open/closed beta. All the foilage looks much better compared to GTS, I think the lag we had there had to do with new areas being loaded. As others have said, please don't compromise too much in favor of low-end graphic computers, or have optional settings/install options. Agree with you. Just look at examples of Battlefield 3, MW3, etc. They strike for high-end graphics. I am willing to upgrade my pc if necessary. Thanks. So I'm guessing around $300's is high-end ones then? what is in your opinion a high-end card, because i consider a ATI HD 6850 a high-end card. Like other posters i'd suggest have different terrain settings. People with lower end setups can opt to have less foilage density while high end players can have the stunning detail shown above... although this doesn't look at all like the UK but hey, i'm just knit picking. SCS Software should consider a Poll. 4. below average (old) card"
true, but SCS will know what they're up against, and can set a standard. how would a noob know in what section their graphic card is classified. But every gamer needs to change machine, and in my case, I'll trade in a few months at least before the game's release. But please put this as an option to pick, for people who have a computer ready to run at maximum with the best graphics of the game supported, but also put an option for people with low graphic computers 'weak' or old, so for all people buy and have fun with the game, regardless of the graph. It's nice to hear that you care about others Eric, just because you have a high end card, doesn't mean everyone else does. Hi SCS Leutzu01 is calling again!! I really appreciate what you did with this amazing game. 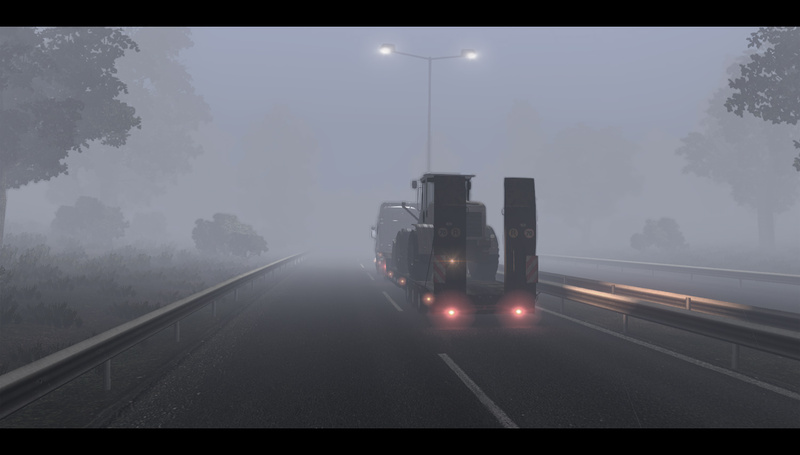 I like the fog effect and the trees effect and i like that the warning lights on the trailers work great and I hope that the warning lights for the truck will work like the warning lights for the trailer like: when you deliver the diesel or dangerous goods they also work and i want to do you the same thing with the fog lights on the truck and on the trailer. 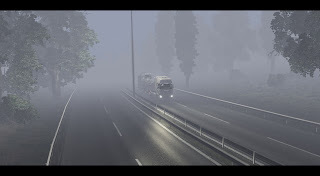 You know: add some fog lights on the trailer to see them better like: when you activate the fog lights for the truck, the fog lights on the trailer will work the same with the fog lights of the truck and also if you could add an application which detects head movements would be great indeed. I know that you have an application or exist on the internet that does this thing. I think it's calld "TrackIR" hope that you could add her on the game. could you also add some oversized load and work on the fog lights would be very great for the players and also if you could add some sensors for the truck like: when the rain starts the wipers go on and when the rain become worse the speed of wipers will rise a bit for better cleaning the windscreen and when the rain stops the wipers go off automatically and the light sensor also will be great like when you drive the truck on the sunset they activate also automatically when it detects the lights become darker and darker when the time pass and also you could add some features on this sensor as well like when you drive the truck alone on the dark roads he activates the high-beam light and when he detects nearby vehicules or the opposite ones it returns on the low-beam lights to not "blind" them and when you become alone it activates the high-beam lights and about the lights system could you add some adaptive headlights which makes the light beam to move in curves to see more better the road. this kind of light system exists on modern trucks I think. I upload a link bellow with this kind of adaptive headlights to make you more clearly about my wish. I know that is on a car and not on a truck but it would be great to add it at the lighting system of the truck and last but not least if you could add an effect of the light beam of the headlights would be phenomenal such as seeing it through the rain drops, fog and why not even into the night. I really appreciate your awesome work and I hope you could understand me i want to add these wishes because i think that they are awesome for this game and i hope that they are achievable as well. SCS SOFTWARE REMEMBER THAT I HAVE GEFORCE 8400 512 MG. Unfortunately, the game will not run satisfactorily on what was an entry level card of the 8xxx series 5 years ago (http://en.wikipedia.org/wiki/GeForce_8_Series). Sorry, the card will not be officially supported. Either we push the graphics quality forward, or we would have to stick with 18 Wheels of Steel level of detail/graphics. Read it and you'll understand wich vic card will work and wich not.. I found mine Entry-Level GT430 wich I think will work good on low and medium .. Go read it ! Will the Geforce 200 series work? It should, right? why does 8400 work on need for speed 2010, but it doesn't on ets 2??? Do something with these trailers. POSPED trailer looks not good. Why not have a MEGA trailers. Please correct trailer because it does not look like really trailers. I Agree that Idea WE WANT DRIVE MEGA TRAILERS BREZENT ! -The option to be able to see at some point the screen, the hour, day, month and year. And depending on the month, there is the appropriate time. - In ETS1 cars are fast acting and strange (fast, as hard braking, and strange as hard braking within the highway for no reason, or brake when leaving the highway). it could just be like this. When you want to change lanes with a flash of right, no need to stop the car to change lanes but from the third to fourth car behind us to slow down (no bone) so you can prioritize the lane. - It would be most useful to see more traffic signs, because there are very few and difficult to drive, increasing the penalty. -Some accident option would be nice too,like leakage of oil,or engine's liquid leak,or flat tire etc. pavements and wait at traffic lights to get across. As well as cars, that is to be placed on companies that want to get to us and we make it difficult to maneuver in order to unload the cargo. And still there are people at the gate of each company and 1-2 employees that will help us to maneuver. -Also something that we saw in the truck and trailers were tolls, something which must exist, as well as for taxation of money for insurance company in case of accidents. -As well as bridges go up and down the highways, crossing of trains on country roads. -and finally, it was very good (through choice in the game) to become an accident in direct visual contact (such as a landslide, subsidence of the road, etc) where should we react properly and to avoid collision with car. if it could be watched police to coordinate the traffic in case of works in the street, an ambulance in case of accident. I know that all this is very difficult to make because they want a lot of work, but it's just things that happen on highways. Congratulations again on such an excellent job. SCS TEAM I I want to ask a question ! Why publish '' 1500 X 739 '' resolution screen shots? SCS.I think it is not wise to show things that you not intend to put into this game,overhyped game can cause too high expectations and finally disappointment,some things just need to keep in secret.Now people is worrying if they have enough strong pc...who cares for trees this is not a forest simulator.Rather show us some new or upcoming improvements from this game,and what else you intend to put in game...before it is too late. Make different type of road works. 1. The road sides should be lots of moorland like grass, rather than just trees and long grass, it's more realistic, and doesn't need as high system specs. 2. Please sort out the slip roads, it's not a huge request, is it? 3. Be able to select the weather (eg, foggy, rainy sunny etc) and intensity of the weather. And by the way, ignore people with huge requests such as real trailers, don't throw your money away on things like that. People that complain about the small details, are obviously real life truckers, so why they are playing truck simulators, I don't know. PEOPLE IS ASKING FOR IMPROVEMENT ON GAME NOW GUYS TIME TO IMPROVE YOUR PC....HYPOCRITS...FIND A JOB AND UPGRADE YOUR GPU...BUT SCS WILL THIS GAME RUN ON ATI GPU???????? You're a patetic flamer...find a job? Why don't you give me one? I wanna see if you have balls to say that in front of my face loser, you'll eat your theets!! you want to work tell me where you live. fail scania mirrors,but environment is great. Yeah right, mirrors where better in older images, they are a bit... weird now. if you want to work tell me where you live. Finally,an in cab sat nav.Would it be possible to also select what music ur listenin to whilst driving through the in-cab computer/cd player. Jaysus, these pics: (especially #3) looks almost as a photo taken in real life. everyone asking for SCS improve the game and now people want to play new genaretion games with old GPU....c`mom guys its dont make sense and asking for better physics and still playing with keyboard, mouse joystick...lol...some time i dont believe. Peaple from good european countrys crying because dont have money, go find a job...lots o immigrants is working...france, england, germany, spain, portugal, italy, czek, lithuania, swedem netherlands, holland and etc...i know nobody want to start with litle money and hard work...right? should be something about this. Hi SCS Leutzu01 Is calling again for more wishes and i hope that they are achievable as well. First of my wishes: could you modify the practicality of semaphores in intersections in cities such as to add some timers above them and make them work only for a single lane of the intersection like when you go for the turn right or left they should work only for that lane and not all semaphores should work at the same time even if you steer left or right in the intersection. The next type of light traffic that i want to see is a traffic light which works with flashing green light for turn right or left and also I would like to add traffic lights with flashing yellow lights for pedestrian crossings also what i want with the traffic lights is to be switched off on the 12 PM o'clock or choose when they will be switched off and when they are switched off the light will only work on the yellow flashing and you will respect the rules of priority or other rules. I met this problem in older versions of games and did not liked. That is why I would like to be able to make you work on this type of problem and try fixing it. Third could you add some pedestrians because in "Truck & Trailers" game it have this cool feature and with for the 10 years or older kids that would try to kill them try not to make them bleed or you could make them passing through the truck but the truck driver will receive a major ticket for the attempt to kill them. And with that fix you don't receive any ban for this kind of violence. Last thing that i want to see if you could make a video about tuning the truck with accessories. 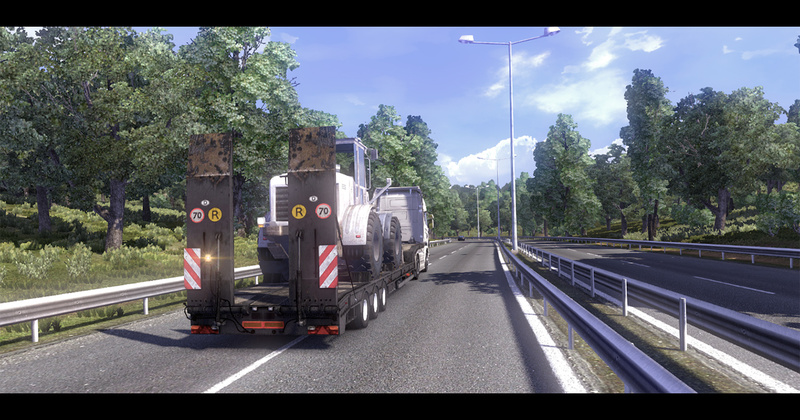 The game and especially SCS Sofware are the best developers of truck simulation games in the games industry i ever seen! I suggest ever fan of the truck simulation games to buy the game when it's released and support SCS Software's team for their great work in the years. I'll buy the game because i'm a big truck simulation games fan and trucks fan. I can say one thing to SCS Software team: Guys, congratulations for the amazing work that you are doing and continue developing that amazing simulation games. Hot scenery! Thats the thing, what we see on the roads! Not some loop of same objects every kilometer nor unrealistic weather that doesnt even make a need of wipers! Heh, good work SCS! Plus i have an opinion about the vehicles... They just hmm... Seem like out of the showroom 10 minutes ago... What about some getting-old signs ? Dust-Rust-Paint losing saturation and needing a renovation time to time ? Does anyone have a suggestion which video card I should buy if upgrade needed? 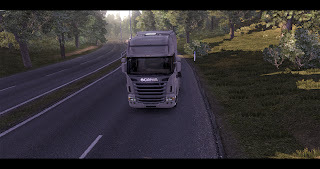 SCS staff wanted to give you some tips that would have much in Euro Truck! Effect of rain could be alternately strong and weak, and the road could have a nice effect "WELL WET" when trucks and cars passasem with wheels (or tires) shooting water up, and most importantly increase the reality of rain hitting the Windshield! you could put new effects inside the truck as the character's hand and arm Flywheel Truck, and his on and off the radio when we select a Music!! leave the truck at a speed much more real options Trucks in store!! that is asking too much for you! but you could put pedestrians in the game (but not in any way to spoil the game! putting straight :-)!! place new types of cars on the street, and increase vehicle traffic on the road!!! add houses, football stadiums, churches, schools, streets and avenues! improve the effect of shadows!!!! and make the ETS a lot better than it already is!!!! and please remember not to give away to much about the games. SCS ALL IS PERFECT JUST MAKE THIS GAME WITH MAX CHARACTERISTIC, BECAUSE WE HAVE STRONG COMPUTERS DONT WORRY FOR THAT! Multiplayer, Big Map, High graphics, Pedestrians, Real truck sounds and real physics of all trucks! I just want tell you don't release this game in August release this game in December, because we want look full completed simulator game, with all this things what we said in previous post ! Therefore don't WORRY WE WON'T DISAPPOINTED FROM YOU !!! YOU CAN DO THAT TO CREATE A AWESOME SIMULATOR AND RELEASE IT IN DECEMBER FOR MAKE IT ALL THIS THINGS WHAT WE SAID OF PREVIOUS POST!!! I agree,we do not want a small budget-game.We want a complete game worth buying. then price will be for a complete game. This is a SIMULATOR, it means it has to be realistic, have you ever seen 1 of this trucks on the road??? Only the new Mercedes Actros is, those others you are showing are concept trucks that aren't even on the road. Go study before you post a comment. SCS please do give us a dirty truck and also make the glass to us dirty and can spray washer fluid, so we can wash the glass if possible please make this feature will be very nice. My question is whether it will make the original wheels of the trucks that are truly.